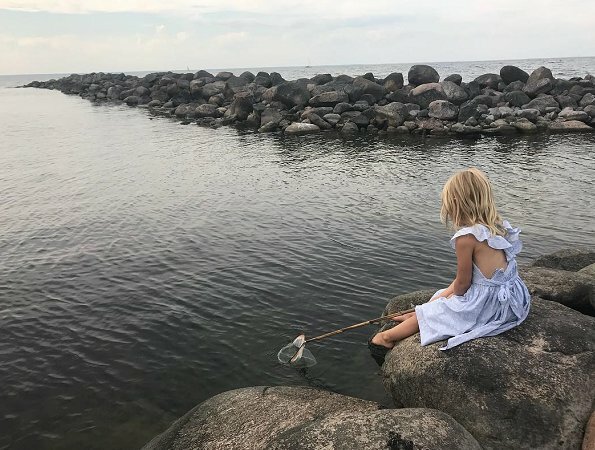 Swedish Princess Madeleine shared a new photo of Princess Leonore with the title "Patiently waiting..." on her Instagram page. The appearance of Princess Leonore patiently waiting is very adorable. So Madeleine wants to show us her daughter can behave finally. I saw the christening of the third child in june last, and no one knew what to do with this spoiled girl. Adorable photo of little Leonore. On n'avait jamais vu Leonore si calme... Elle bouge toujours tout le temps! Calm, nice picture of the little Pss. Honestly I don't like this picture, to me it looks so artificial to have a child on his own on a rock, just bad example and bad communication. Yes we all see the purpose but just not a good idea. We don't see her face but she might just be impatienly be waiting for the end of the shooting. Didn't you sit on a rock/shore as a child trying to catch a fish? Fishing takes a lot of patience and waiting you know. Oh, I don't think it's any more artificial that a photograph of her chasing a butterfly. I don't think for a moment that little Princess Leonore posing. I could be wrong, of course, but think she is literally just sitting there quietly- which is amazing, given her tendency to run about all the time. Which is maybe why her mother wanted to document it! Wow!! You must be the life of the party!!! the child is sitting good on the stone, minimum 1 person (the one taking the pic) is near to hear, I don't see a bad example. Some people are never happy. Its bad when Leonore runs around. Its bad when she calmly sits alone on a rock. I can't imagine ball of fire Leonore patiently waiting for anything. Is she waiting for a fish? Is that how they catch fish in Sweden? Sit with a net instead of using a fishing pole and bait? She is a child, not a professional fisherman. I think that's very typical "fishing style" for the kids - at least our children have the same hobby. And what's wrong sitting on the rock? No, we fish with fishing rod, net or fish trap. But kids often like to catch (try and get some if lucky) baby fishes who swim afloat with little net bags. Some kids do it for hours. I can see how Madeline wanted show this pic about always running and not concentrating Leonore, probably the only moment she is siting still. As mother I would myself be worried the kid could slip to sea. Wow Karen!! Way to turn a nice moment captured by mom into a snarky comment towards a child and your sarcasm about Sweden is priceless... rude much? Reading some of the comments ... and I understand well why celebrities have to protect their children as much as they can. The pic is staged of course but it is nice with those colours and it's so Swedish summer feeling. I absolutely agree with you,BlueSaphire70! She is not a toddler anymore, she won't fall in! And it does not serm very deep, plenty of time to pull her out if she does. To my eyes that looks deep and rough road to reach if the kid falls. Also there are big stones where kid can hit her head. I would not let my 4 years old sit there without life vest. Especially if the kid is famous to be adventurous and lively. Drowning is the major reason for kids for accidental death here. Just in May and June five children did drown in Sweden. What you are hinting here is a bad and careless parenting. I'm 100% sure if the stones had been slippery and dangerous, Madeleine would not have let Leonore to go there and sit on the stones. I remember sitting on similar shores as a child, and there were similarly looking stones, non of the kids slipped, stumbled, fall into the water. Naturally water can be very dangerous and you can drown even in a small puddle, but that is why parents watch over their children when they are near the water. Sure if you were lucky enough to survive without all caution it is of course unnecessary today! Times have not changed a bit! You sure also remember very well how you were three or just turned four years old and were sitting at similar rocks. When I was child we also did what we wanted, nobody looked after us, no care if there was lake, river, sea, railway, angry animals, what so ever near. My sisters and I were also lucky to survive but all kids in our village were not. Child mortality was high, but boy they were SO good old times... or not. My mother left also my four years old sisters to take care of me when I was just a baby, nobody else were at home for hours. Do it today or leave your kids without care, child protection persons would take you away from parents in nano second. It is so stupid to implore how things were when you were child. I have five kids myself, one was very lively child, a born adventurer really. I mirror quite a bit my thoughts with my child to Madeline and Leonore, as said before, I would never have left my child to sit there without life vest. And I know very well those shores, we spend month and weekends sailing at Baltic Sea every summer. My comment was not about hinting anything, but now when you did take that subject down, I can say Leonore takes her parents 6 - 0. Parents do not mainly have any contact to that child, she was totally out of control in that christening video, parents did not even try to control her or did not even notice her. I disagree that Madeleine and Chris do not control or have contact with her. Madeleine was there to take photo, its not like Leonore was sitting there alone, untended! Madeleine also scolded Leonore during the christening. Its not possible to pack your child into cotton, never let her/him away from you in fear that something will happen. Its not like Leonore fell in or drowned or have we ever seen her bruised or in a plaster cast?? @Blondiini, sorry nobody looked after you but just because your mom left you alone often, you had bad experience does not mean Madeleine and Chris do the same with their children! At least 1 person is close to Leonore. Sorry but I fail to see a bad example in here. Its not nice to critisize parent who has active child. I'm sure they are aware of it and unhappy about it. But how can you say from short appearances that her parents do not notice her nor try to control her? Leonore behaved well most of the christening but as the service was long, she got restless. But hey, lets blame her parents in evry sin! Anonymous you missed my mark totally. I was trying to say what was Ok ages ago is not so today and for good reason. My feelings were totally redundant. My point was today is very different than time in our youth. And that is not any bad thing. Also you were the one who brought up their parenting in this tread. Hmmm, I have never seen anyone sitting on the rocks with a life vest on...u are supposed to wear life jacket ON the water, when you go sailing, isn't so? Why notto to ask wear helmet all the time? Who knows when you fall down or something hits you on head? I agree with previous comments. Its natural parents worry about their little kids but excessive caution can do more harm than good. We all fell down, hurt our toe or knee, perhaps even broke something but we learned to be more careful, we also learned our boundaries. Its said that parents who worry about catastrophic events all the time and bar their kid from living life raise an adult who will be passive later in life. Still when parent see dangerous place/situation, they stay close to their child or forbide the kid go. I don't think this shore was dangerous and I'm sure Madeleine knows her child well enough to know where she can go, where not. I have seen dozens of kids fishing like Leonore and cannot get even one to my mind who would have been without life vest. Not even when the kids were near easier reach lake shores. After they learn to swim it is of course different situation. Anonymous you must be provo? Excessive caution when there was already five kids drown before summer even begun in Sweden. How many you think is suited number after what you can protect your kids, 20 or more? Just to teach the kids themselves to be caution? Really! No parent can look after children every second, not even every minute, and it takes only a eye blink a child to run away and fall. And these rocky shores are never any easy place to catch anything fallen. It is very different to compare hitting a toe to danger to drown. Drown child can learn nothing afterwards. But of course the parent would remember her carelessness whole her life ahead. May I ask were do you live, where is life of child so worthless? I hardly think this is a posed shot. If it was, her dress would have been zipped and tied neatly, and her hair would have been brushed. Why can't this be just what it looks like? A sweet picture of a girl sitting on a rock at the edge of the water. Haven't all kids done this? Littel sunshine Leonore lookes very relaxed to me. Thank you for charing this pic. In comparison to the christening the opposite feeling. Every parent makes mistakes. Parenting is challenging and every parent learns something new a day quickly or slowly. Leonore can sit still. Darling little girl.